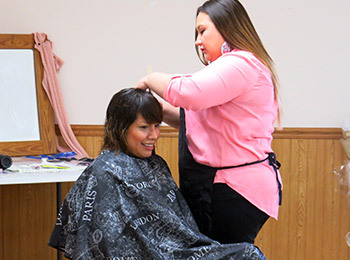 Winona, who is stylist as well as a Sexual Assault Project Coordinator/Advocate at Cheyenne River Indian Outreach, provided haircuts free of charge throughout the day. LeNae, Outreach Coordinator for Cheyenne River Indian Outreach, walked everyone through a breathing and meditation exercise, setting a peaceful mood for the day. 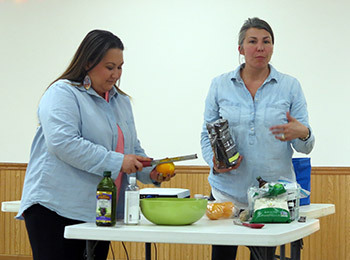 Similarly, Jessica with Oyate Connections helped participants understand how stress might trigger some extreme emotions and shared coping exercises. Journaling is also a useful coping strategy that can be done almost anywhere, any time. Kim, owner of Eagle Beauty Skincare, shared a recipe for a facial scrub using household ingredients. In addition to taking care of themselves emotionally, participants also got some pointers on how to take care of themselves physically. The variety of speakers for the day provided tips on skincare, beauty and using essential oils. Kim, owner of Eagle Beauty Skincare, shared a recipe for a facial scrub using household ingredients. Winona, who is stylist as well as a Sexual Assault Project Coordinator/Advocate at Cheyenne River Indian Outreach, provided haircuts free of charge throughout the day. Participants also learned about programs in the community where they could seek help. One such program they learned about was Healing with Horses, which uses animals for therapy. Your support allows Cheyenne River Indian Outreach staff the opportunity to work alongside others to make a positive difference in their communities. Thank you!